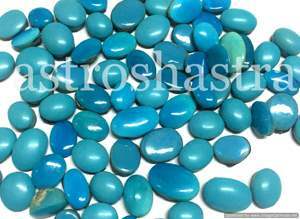 Turquoise Gemstone is also called callais and is an opaque stone that ranges from sky blue and blue-green to apple green. It is a hydrous phosphate of aluminum and copper, with a hardness of 5-6 and a triclinic crystalline structure. The pure blue color is rare, and traces of iron make it greener in color. It is most commonly found in a matrix with veins of dark brown limonite, dark gray sandstone, black jasper, green malachite, and blue-green chrysocolla. of sky blue colour. It is good for persons of birth Nos. 1,3,4,6 and 8. It is extraordinary good for liver ailments , for protection against eye ailements and good for throat infections. It protects the wearer against untoward happings, accidental dealth or violence of any kind. It generally protects from enemies too. It denotes courage and love. It is a symbol of youth, vatality and innocent love. It bestows a sence of general well being to the wearer. The meaning of the word it Turksih. This gem was originally found in Turkey. It is one of the first gemstones mined and varies from sky blue in colour to greenish. It is commonly found in microcrystalline, massive form, usually as encrustations or as nodules. Sky blue coloured from Iran, is the best, but in Tibet a greener variety is found. Mexico and USA also produce greener variety. Chile, Australia and England(Cornwall) also produce it. The distinct blue colour is due to presence of copper and traces of Iron. It has hardness of 6, specific gravity of 2.80, Refractive Index 1.61- 1.65 and is chemically Hydrated copper aluminium phosphate. The crystal structure is Triclinic and the formula is CuAI6(P04)4(0H)8.5H20. It has amazing property of helping in disorders of female reproductive system. It increases eyesight, tissue regeneration and circulation. This Birthstone is very effective in headaches and migraines. It also decreases fever, cataracts, and effects of environmental pollution, anorexia, and stress. It balances circulation, tendons, ligaments, throat, thymus gland, and nerves. It is very powerful in curing headaches and body pains and is good for those belonging to birth numbers 4 or 8. The user is bestowed with the qualities of generosity, magnanimity and honesty. He will also be found to be dutiful and of liberal views. The wearer will also be associated with ideas connected with expansion, joy, happiness and prosperity. It bestows an aristoratic and royal type of temperament and thinking. It is also strongly recommeded for those seeking spiritual enlightenment. 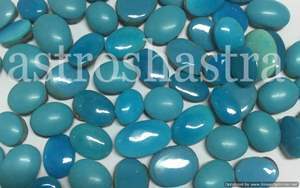 It is a vibrant light blue stone often seen in southwestern jewellery. It is reasonably priced and quite lovely. The name many have come from the word “Turquoise”, French for Turkey, because of early belief that the mineral came from that country. Another possibility could be that the name came from the French description of the gemstone, “pierre turquin” meaning dark blue stone. Chemically, a hydrate phosphate of copper and aluminium, it is formed by the percolation of meteoric or groundwater through aluminous rock in the presence of copper. It helps one to start new projects. It has been thought to warn the wearer of danger or illness by changing colour. It is also believed to bring happiness and good fortune to all. Legend: Tthe robin’s egg blue gemstone worn by Pharaohs and Aztec Kings, is probably one of the oldest gemstones known. It was being used before 4000BC. It has been, since about 200 B.C., extensively used by both southwestern U.S Native Americans and by many of the India tribes in Mexico. In the 13th century, it was thought to protect the wearer from falling especially from horses. Legend has it that the Indians believed that if it was affixed to a bow, the arrows shot from it would always hit their mark. Majority of the world’s finest quality comes from the Unites States (Arizona, California and New Mexico), the largest producer . It is also found in Australia, Chile, Iran, Mexico, Tibet.